The ability to swim in an on-site pool or at the nearby beaches. This camping site caters to children. Restaurants, bars and food provision facilities. This luxury camping getaway provides all of its guests with only the most modern of facilities. The mobile homes are perfectly suited for a family and each is supplied with its own dedicated electrical power. Wireless Internet is likewise included within any standard pricing package. Tumble dryers and washing machines can be used at one's convenience and a snack bar is close by to provide a tasty treat or a refreshing beverage. Unlike some other holiday camping sites, Acqua e Sole is perfectly able to handle the needs of families who choose to bring their children along. A secure play area is available and staff are happy to provide entertainment. This is a great option for any parent who wishes to enjoy a bit of peace and quiet during their holiday. Camping luxury should involve a certain amount of fun alongside rest and relaxation. At Acqua e Sole, guests are able to partake in both. In regards to leisure activities, sports such as volleyball, football and table tennis are found within walking distance of all mobile homes. Fitness classes, stretching sessions and an "Aquagym" workout are likewise possibilities for those who wish to remain in shape during their stay. 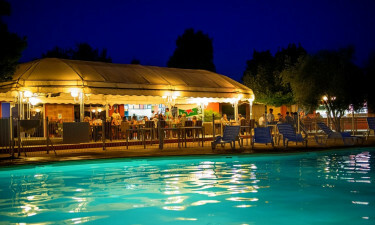 This luxury camping site is proud to be able to offer quality restaurants for all guests to visit. With an emphasis on healthy and yet delectable meals, there is no doubt that many different tastes can be addressed. There may still be some who wish to enjoy international cuisine or choose from a takeaway menu. A pizzeria will gladly provide such options. During both low and peak seasons, it is possible to stop by a quaint bar. A television will display sports and other forms of entertainment. Patrons can partake in a glass of beer, a cocktail or a local wine. Any camping holiday here is made even more convenient due to the presence of a market that is open throughout the entire season. Common provisions such as fruits, vegetables, frozen foods, meats and bread can all be found here. Souvenirs and other essentials including sanitary products are likewise sold. In fact, it is even possible to rent sheets for a bed on a daily basis. LUX-camp is able to provide much more detailed information for those who are interested in this one-of-a-kind holiday camping site.